Pastiche rides the high frontier in Miike Takashi's Sukiyaki Western Django, a film that strips the Kill Bill model of genre spoof down just to referents, quotes, and iconography, leaving strewn along its path the wreckage a blunt critic might call "the point." Not being acquainted with Sergio Corbucci's Django film, or for that matter any Spaghetti Western outside of Leone, it may be hard to fully understand Miike's gleeful intention of superficially aping the genre with much exaggeration and minimal heart. Gleeful it and its pleasures are, but suffice to say that even the most superficial of those canonical Spaghetti Westerns had at least an ounce of expressive impact in its desolate, transplanted landscapes, or Eastwood's taciturn demeanor. Miike's film, for all its exuberant fun, like its lone wolf cowboy hero, leaves no trace of itself behind but desiccated corpses. Which is not to fully disparage Sukiyaki Western Django, because the heights it goes to attain disposability are certainly wild and welcome. Exhuberance is rare indeed in the cinema, so when we see it, we welcome it with open arms. 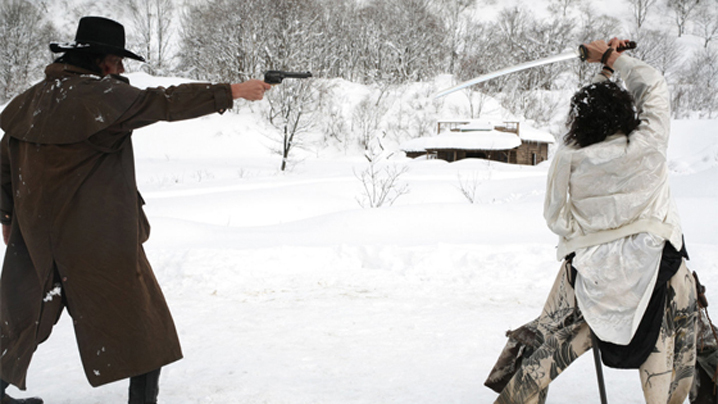 A Spaghetti Western shot in Japan with Japanese actors speaking a wide variety of English, from fluent to phonetic, featuring the most programmatic Yojimbo-esque plot of a gunfighter arriving in a town divided between two cruel and violent gangs, part of the film's sheer, unadorned pleasure is its transplanting of Western conventions into an absurd context. If Leone did the logical thing by turning Kurosawa's ronin into a lone gunfighter, Miike and fellow screenwriter Nakamura Masa do the illogical thing and bring it back to Japan, absurd quasi-American, quasi-Western idioms raining out of the mouths of a cast whose English ranges from incomprehensible to simply heavily accented. Clearly the maximum effort went into turning the script into an English approximation of the genre, with only the most passing and cursory attention given to story and all the senses of character, location, emotion and expression contained within. Yet Miike's gonzo-cinema, one of genre-hopping and problem solving, reigns supreme yet again with its myriad of distractions. Whether it is Quentin Tarantino's hilarious, bizarro cameo as both the film's storyteller and aged gunfighter sensei, the never ending joke of the Japanese cast speaking bad American lines in mediocre English, or Kitamura Michiko's fantastic costume design, the film has a kind of excited, and excitable iconographic magnetism as its heart rather than any kind of conventional "content." It's not just the pleasure in recognizing convention, as that is no pleasure at all (in fact, that's how nearly all mainstream cinema survives and self-propagates). Rather, Sukiyaki Western Django takes the cues we recognize and ratchets up our smug acknowledgment of those cinematic conventions to such an absurd, extreme degree that one must laugh. Overboard is the operative description, and for a while that's all the film needs to rely on for its success. That extremity can run its due course and then run out, leaving the film in a drought of meaning and importance, should have been clear to such a veteran as Miike—but with so much pleasure in the actual filmmaking being apparent, it also seems clear that the conductor of this wacky train was carried away by his own enthusiasm, most of which he successfully inspires in his audience.